Music, Food, News and Political Commentary. Serving the So Cal Wine Country of Temecula Valley; including Menifee, Lake Elsinore, Murrieta and Hemet. DTLA, CA – Though it may sound like a joke [and the answer will be given at the end of this report], the current state of the country, the imperial decree signed by Obama (and Bush and Clinton), and the latest wad of missing cash ($7M/LA gasoline) plus the latest missive from Assemblyman Kevin Jeffries delivered to this reporter all point to another joke(?). Supposedly an original copy of the Constitution written on hemp paper had the word ‘subjects’ crossed out and ‘citizens’ penciled in above it. That would certainly explain why every member of Congress is verified with a million dollars in personal assets and over $30M with familial assets. With money as speech (1976, the 200th anniversary of the country, and done that year just to laugh at the ‘citizens’ who were watching the tall ships instead of the nation’s board of directors, the SCOTUS, and before the Bush/Obama/Clinton/Reagan administrations), and corporations as persons in 2008 causing Barack to ‘blink’, the Era of Common Royalty is here. Remember when your granddad used to say, “Son, the country is going to hell in a hand-basket”? Well Sports Fans, stretch your legs, relax and get off the bus. The ride is over. We are there. Rolling in on the night of October 1st with my T-town ride Sam Gray, we departed and set up the tents with all the other subjects, I mean citizens, at City Hall, downtown LA. The energy was electric and given that two detectives being shot in Korea town caused no police presence at the LAPD HQ just across the street, also magical, though at that moment neither Sam nor I could identify it. The Korea town knowledge had not been gleamed. In the ensuing two months, in camp and out, suffering kidney stones, rainstorms, shitting in front of strangers (OSD), blasting helicopters and sirens, watching live democracy, real democracy with and from poor people who combined would not add up to ten grand in personal assets, it was an experience not unlike though completely different than Burning Man. Unbeknownst to this poor commoner, things were different outside the camp. A New York-based Serbian artist had just closed her Museum of Modern Art retrospective, “The Artist is Present,” where she appeared in person, sitting for hours in a long red dress and locking eyes with visitors who endured winding lines to sit across from her. For her next gala performance, she planned again to subject guests to unnerving intimacy but she needed help to do so. At her next gala, most of the table centerpieces would be rotating human heads that would lock eyes with guests as they circled. positioned naked bodies would rotate around six additional tables. A chorus of volunteers would also be needed to dress the guests in white lab coats. Auditions were held that attracted a number of admiring artists, dancers, and actors. Prospective performers were warned that gala guests could try to poke or feed them, that they would be expected to sign a non-disclosure agreement, and that they would be paid $150 plus a year-long MOCA membership. The guests at MOCA’s annual galas are patrons high in the economic hierarchy: politicians, heirs, celebs, moguls, and entrepreneurs who’ve made bank. Tickets cost an arm and a leg — they ranged from $2,500 to $10,000 at this year’s gala on Nov. 12 — and the draw is always that some particularly famous artist “directs” the event, a deal made sweeter by the appearance of a ‘token’ celebrity or two. 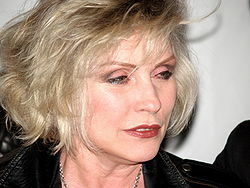 This year’s token was Debbie Harry [Blondie, TV, movies]. Artist Marjan Vayghan helped guests into white lab coats as they arrived and recalled that some reacted viscerally to the prospect of covering themselves up. Artist Honey McMoney, who also helped with the lab coats, noted it became increasingly difficult to tell guests apart from the waiters, volunteers and performers. “The nature of the power structure started to crumble in a really delightful way,” he said. For anyone who has been downtown recently, it is hard to miss the concentration camp motif of City Hall. Installed less than two days after 1400 police forcibly cleared approximately 300 subjects off the lawn, all the major news outlets reported in headline fashion that Occupy LA would cost the rest of the taxpayers $2,300,000 to repair damages, though police overtime just ahead of a downturned Christmas economy accounted for a large portion, as was stated. New York put up $1.8M as a figure if memory serves. Clearly this was promoted to give the general public, aka sheepletown, a nasty taste toward the Occupiers. But the truth comes out, almost always. So what is the actual cost to City Hall to repair what me and 800 of my camp mates caused to ‘public’ property? When the last (rarely) televised cost estimates came out the tag was $400,000 for the 1.7 acre park. However the final costs, the net net to restore the lawns to their pre-Occupy pristine pasture is $76,000. That equates to seven ticket holders at the main MOCA Gala table and 3 people who got to sit by the kitchen. Welcome to the Era of Common Royalty. So now ‘what do you say to naked woman at dinner?